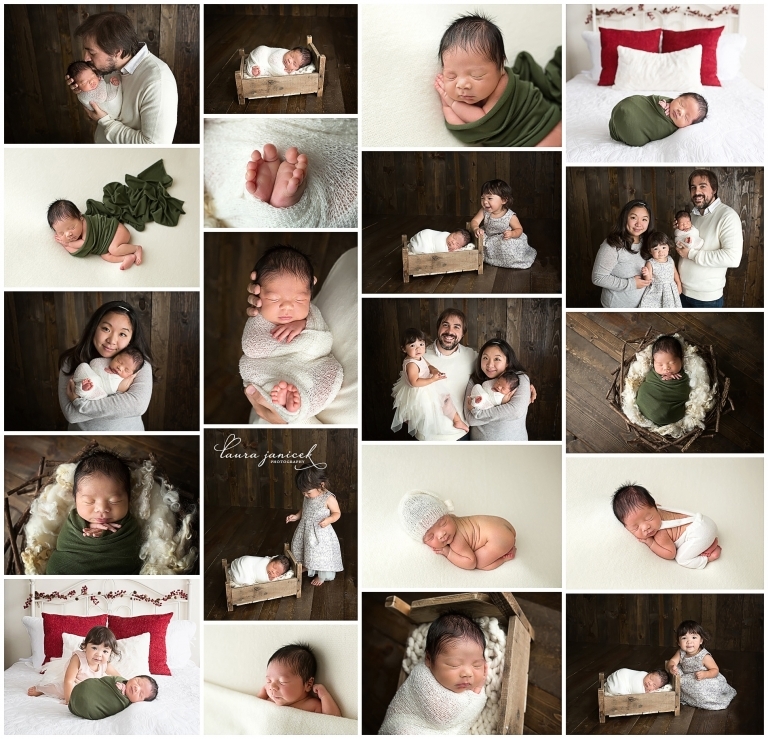 As you can probably tell from his collage, baby Erik’s newborn session took place during the height of the Christmas season. I photographed big sister Margot’s newborn pictures in 2016, so it was extra fun to see her with her new baby brother. She was only 17 months old for this session, but she was very cooperative! Welcoming baby number two to your family is just as exciting as welcoming baby number 1! Sibling images are almost always the most important images to mom and dad and can be a challenge to get ‘frame worthy’ picture without some professional help. Sometimes toddlers want absolutely nothing to do with the new baby at all… And even if they do love their new sibling, it’s hard for them to understand the concept of being gentle. They also tend to have a short attention span for sitting or lying still, so we have to be quick! A professional newborn photographer can really make a difference in helping to capture your children at this life changing moment in time. I typically photograph siblings at the very beginning of my newborn sessions. I try to get those done right away so that we know we’ve got them, and then we can move onto parent and family images (which tend to be the next most important images.) If the toddler is shy or slow to warm up upon arrival, we’ll start with wrapped newborn pictures and the move to family images before sibling shots. This way, dad can hold the older sibling and provide some comfort as he/ she adjusts to the new environment. We have to be flexible when it comes to working with newborns and toddlers who tend to have their own agendas! I book extra time for sessions with siblings to allow for whatever may come our way! I try to schedule this type of session around toddler nap schedules, typically mid-morning when everyone is still fresh and at their best. I also recommend not worrying too much about crazy discipline while trying to get the toddler to cooperate. I have four kids of my own, so nothing phases me! 😉 I find it’s best to let them call the shots to some degree as the priority in the session is definitely getting the pictures!! I do keep little stickers, snacks and smarties on hand, if we need a little extra encouragement. Stickers tend to go over very well and are typically just enough to get us the shots we need! Laura Janicek Photography is currently booking newborn, milestone and maternity clients into July 2018 with limited availability each month. Please contact me using the contact form at the top of the page (desktop) or the bottom of the page (mobile) to inquire or schedule your session! Laura Janicek Photography specializes in newborn portraiture as well as maternity and baby’s first year portraits; serving the greater Nashville area including Brentwood, Franklin, Murfreesboro, Hendersonville, Clarksville, Spring Hill, Dickson, Smyrna, Nolensville, Hendersonville and more with a full service studio location in Brentwood, TN. Laura earned an ‘Excellence in Newborn Photography’ award from NewbornPhotographers.com, as well as a merit award from the National Association of Professional Child Photographers. Laura Janicek Photography is proud and honored to be named as one of Nashville’s Best Newborn Photographers and one of Nashville’s Best Maternity photographers by Expertise.com.